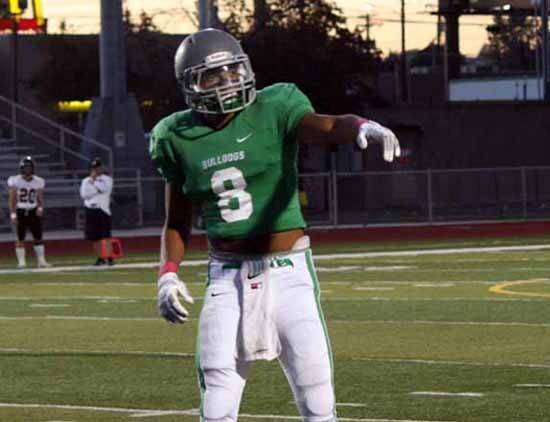 PROVO – Friday night brought another big chance for the Provo High football team to prove that it is for real in its quest for relevance among the upper-tier Class 4A teams. This time, the Bulldogs delivered in a big way, and in the process, sent a message that they will not go quietly as the postseason arrives in a couple of weeks. In a battle against Alta to stay in second place in the Region 7 standings, Provo exploded offensively during the first half to open a 28-point margin by intermission, and then turned it into a 48-28 win that leaves the Bulldogs (3-1 in Region 7, 6-2 overall) in position to visit Corner Canyon next week with sole possession of second place on the line. Alta (2-2, 5-3) is still in position to reach the playoffs, but the Hawks have some work to do, and need some help, if to get a home playoff game. 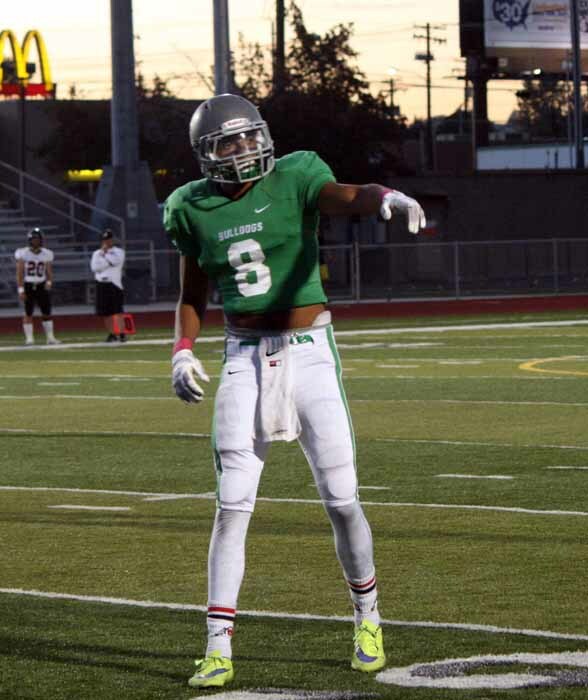 At 6-foot-3, 190 pounds, Provo wide receiver Ty Jones is a handful on any night, but Friday night he seemed to be playing at an even higher level. The junior closed off the opening drive of the game catching an 18-yard touchdown pass, but he was just getting started. Jones hauled in his second scoring toss of the night later in the opening stanza, a 14-yarder that put the Bulldogs on top 14-7. Just before halftime, he made it three scores when he was on the receiving end of a 51-yard touchdown pass from Viliami Iongi as Provo went to the locker room up 35-7. The night was not complete until Jones hauled in touchdown No. 4 on a 30-yard pass midway through the third period. When Iongi needed to make a play, he knew exactly where to look, as Jones finished the night with 10 grabs for 181 yards and those four touchdowns. When Alta’s Joshua Davis ran one in from five yards out with 6:37 left in the opening quarter to tie the game at 7-7, this game took on the look of a back-and-forth barn burner. That message did not filter down to the Provo defense, however. After yielding that initial 80-yard scoring march, the Bulldogs locked things down the rest of the first half. By that time, Provo had that 35-7 advantage and the Hawks faced an uphill battle throughout the second half. Davis and quarterback Braxton Kerr put up some big numbers after the break, but the hole was just too deep. 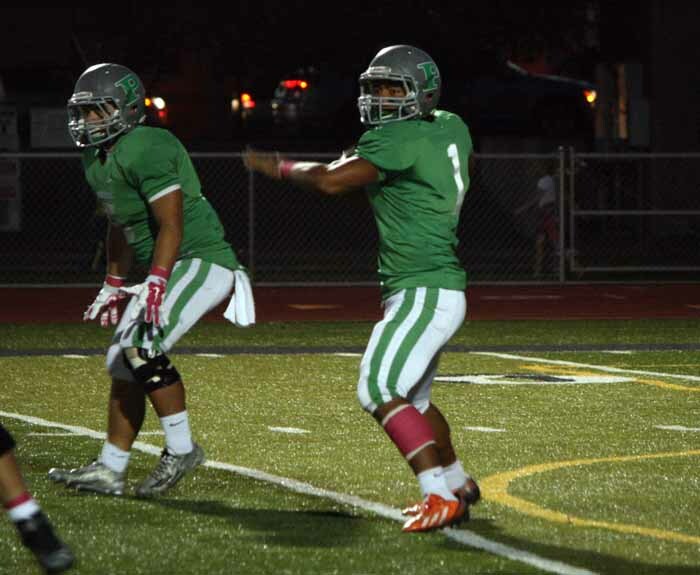 Provo quarterback Viliami Iongi is a playmaker and one of the state’s most efficient throwers. Against Alta, he ran it seven times for 55 yards, but taking full advantage of the huge night by Jones, the senior completed 22-of-32 for 282 yards and five touchdowns. There was one interception, but that was really the only mistake of the night by Iongi. When the Bulldogs needed a play, their quarterback made it, and that included a little pooch punt on a fourth-and-6 late in the third. The kick rolled dead at the Alta 7-yard-line and helped keep the Hawks in the kind of field position that kept them from ever mounting a serious challenge on the scoreboard. Provo’s Hunter Baum is in a unique position to impact the outcome of a football game because in addition to his role as an outstanding defensive back, he is also the team’s punter and it’s punt returner. The 5-10, 180-pound senior had a solid night defending against the Alta passing game, but his work on special teams made life even more difficult on the Hawks. Baum set up the Bulldogs’ second touchdown with a 63-yard punt return to the Alta 14, and he returned another short punt to the Hawks’ 27 to set up Provo’s third TD. Baum’s punts kept the Hawks from starting drives in good field position and whether it was off of a punt, a kickoff or a Bulldog turnover, Alta started most of its drives on its own 20 or further back, an effective weapon. One thing we have learned so far this football season is that Alta running back Joshua Davis is really good. You can slow him for a while with great athletes and a good scheme, but at some point, the 5-8, 185-pound junior is going to find some space and get his yards. Unfortunately, most of his best work Friday night came after the Hawks were down 28 points at intermission, so while the numbers are once again outstanding, this time out they came in a losing effort on the scoreboard. Overall, Alta did get its offense going, particularly in the second half, but Provo was just too explosive in its own right. The Hawks battled all the way, refusing to be shut down by the four-touchdown hole. Davis finished with 267 all-purpose yards, including 20 carries for 144 yards and three touchdowns on the ground and eight catches for 79 yards and a touchdown in the passing game. Quarterback Braxton Kerr passed for 246, with 110 of those coming on seven grabs by Zach Engstrom.